Dons captain, Russell Anderson, made a surprise appearance at Stonehaven Youth Football Club Girls annual trophy presentation last week. The Pittodrie legend presented girls from the under-16 and under-13 squads with their awards for this season. Stonehaven Girls under-16s manager, Alan Townsend, said: “We were absolutely delighted that Russell was there to present the awards and join us in celebrating the girls’ success and achievements over the last season. 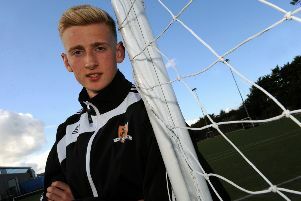 “He is a great guy and a true role model for young footballers across the region. Around 100 people attended the event at Stonehaven Bowling Club which also raised funds for the club through a raffle, bingo and quiz.